I like to order things online. It’s so much easier to comparison shop, read reviews, place the order, and find it on your doorstep soon after. I know, I know, the mom and pop are suffering from the ability to order online (specifically Amazon), but it saves me time and money. Like I said in the last post, I’ve been blending up my coffee with cream and coconut oil. I was drinking it without blending it, but blending it makes it much tastier. But using my stick blender is pretty time-intensive on a short morning before work, so I ordered this – IKEA Produkt Milk Frother . It was less than $10 and eligible for Amazon Prime, and it had good reviews. And I didn’t have to leave the house to order it. Low and behold, a few days later I came home from work to these two packages (one from Bath & Body Works, and one envelope). The frother was in the envelope, nestled inside the box. No instructions, no batteries, just a very light-feeling frother. Much smaller than the stick blender I’ve been using. Don’t get me wrong, I love my stick blender. I first used one when making soap, but then got one for making food. Lovely appliance. But taking it out and cleaning it was too much for me. So, we had to put it to the test. Before blending (cream and coconut oil). It’s not bad. Much more convenient than dragging out the stick blender, but also not as powerful. 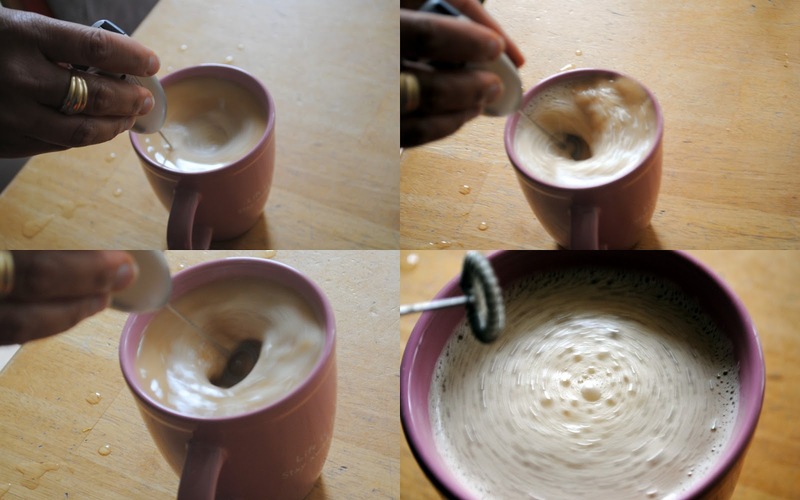 I definitely like to froth up even a simple cup of coffee and cream, or tea and cream. Blended, not stirred. It makes a difference. All in all, I like my little frother. Was a worthwhile purchase. It certainly does the job, and I’m glad I ordered it. It’s been fun already making drinks for the kids. Here was my Bath & Body Works delights. Mostly old scents that you can’t get in the stores, Sun Ripened Raspberry, Country Apple, but also a Coconut(something). They had free shipping plus a percent off, which made it a deal. And I didn’t have to leave the house or use my gas to get it. Yay me. I love to bake. I love to eat baked goods. I shouldn’t eat an abundance of baked goods. So, I take advantage of baking for others. We had a wrestling banquet a bit ago, and along with a big batch of cookies (I make them every year), I decided to try a new recipe. I went to one of my favorite recipe sites (AllRecipes.com) and found these: Caramel Bars. The bars had good reviews, easy enough to make, and sounded delicious. I dove into my day of baking with gusto. There’s nothing like warming the house with time spent creating deliciousness in the kitchen (this was back in February, so the days were still cool). The cookie dough I made the day before and let it marinate in its own goodness overnight, ready for baking the next day. Talk to me about not eating raw cookie dough. A couple batches down (and many more to go). Caramel bars. I doubled the recipe and made them on a large sheet pan. Wheezy was playing outside, but came in hoping for a nibble. And the Money Shot. See, I’m from a time when blogging was blogging (or journaling), and pictures were snapped, rarely edited; raw. Real. Sometimes you got lucky and your photo turned out pretty smooth, but mostly, it was just a simple picture. Now, visit (some of the most popular) blog sites and the pictures look professional, photo-shopped, glossed, and blurred. No child has faulty hair or skin, no food tainted by an unsightly scorch. I hate it. I prefer the ugly blog, the less-than-perfect pictures, the blog that feels like I fell upon an open journal, blemishes and all. I know, with the ease of digital dumping, and fancy cameras, it is almost impossible to take a bad shot. But I also know they are still out there. This is semi-jokingly taken. It’s a decent shot, but the layers of mini waxed paper separating each bar is a copycat of the gazillion photos out there of sweet treats that just happen to be adorned with fancy papers, ribbons and glitter, all appearing to have fallen out of the oven along with the food. I wasn’t energetic enough to add colors, balloons, glitter and an adorable child with manicured hands, smiling in the background. But picture it in your head, mmmkay? They didn’t really cut so well, so we had a few “rejects” to munch on. More than a few. I love my McCormick California Style Garlic Powder. I do, I do. I use it as my go-to garlic powder (I skip garlic salt and if a recipe calls for garlic salt I add garlic powder and salt). I use it as the base for my homemade pizza topping. It has a coarser grind and splash of flavor/color from the parsley. But I also like to simplify. I like to make things myself if I can. Not to mention, whenever I’d buy the McCormick kind, I’d be spending more money than I cared to spend. So, I made it myself. Pretty simple ingredients, both of which I purchased bulk-size from Costco (which sells some McCormick, if you like that kind). You can see in the picture that I used “California” garlic, which has a bit of a coarser grind. For the price of two bottles of the store-bought kind, I can make about 2-3x as much of the mixture (and have enough parsley to use for at least 6 more). The ratio I used was about 3:1 garlic to parsley. But you can tweak to your desire. I have made it with regular-grind garlic as well and it did fine, but I prefer the coarse grind. Works for me! More baking. Love to bake, need to learn how to avoid eating so much. Four boys and a husband should be able to do that deed for me. Today I made this: Downeast Maine Pumpkin Bread from AllRecipes.com. I used my pumpkin puree from yesterday. Ooh-la-la. My plans were to make the bread and have Frank take it to Franny’s soccer party. Plan was good. The boys gobbled down slices of the bread before I could even get them arranged on the plate. I put the kabosh on that. And then Frank forgot the nicely (not really, but we’ll pretend) arranged platter behind when he left. Whatever. I get an “E” for Effort. Here’s the review I left of the bread. If I were feeling less lazy I would have taken a picture and wrote up a little more here, but… eh. 1.) I made mine using 2 loaf pans, 9×5 I believe. 2.) I added about 1.5 cups of milk chocolates at the end, after everything was mixed. 3.) My toothpick NEVER came out clean. Even after 60 minutes. I cooked them about 65 minutes then took them out, letting them cool on a wire rack in the pan. I removed them about 20 minutes later. I was very fearful they would be a gooey mess, but they were not. Moist in the middle, and yummy. The only thing I might do different is try to go a little lower on the sugar, but based on the raves from family, maybe I’ll leave well enough alone. Tastes good with chili. And wine.